The action of Wheel of Plenty seems to take place in an amusement park, with rides, circus tents and bumper cars being visible either in the background or among the symbols. Designed by Microgaming, it’s one of the titles that they have and which come with some very special features, offered through the wheel of fortune in the bonus game. 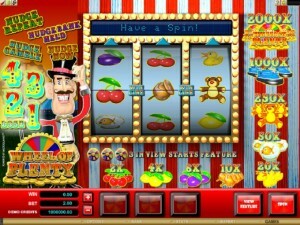 The game is colorful and well enough designed, more so than most of the 3 reel titles available on the market. 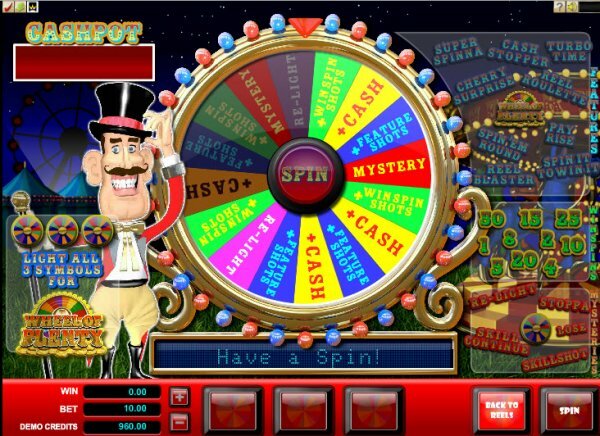 Wheel of Plenty awaits you with lots of cool options, though the mystery prizes, winspin shots, nudges and bonus games are accessible through a single feature. The game has only 3 reels and 1 line, with top payouts of $20,000. The game has plenty of things to give you if you’re looking for features, but you will have to gain access to the bonus game to get them. You need three Fortune Wheel symbols to be visible on the reels, making these symbols scatters. When you meet the requirements, a new screen will load, where the wheel of fortune can be found. You can spin it once, and you will get various types of prizes. Among them there are nudges, winspin shots, feature shots, mystery prizes, cash prizes and re-lights. There are also more than a few bonus games that can be started through this feature. A couple of names mentioned on that new screen include Cash Stopper, Spin It To Win It, Reel Blaster, Spin’Em Round, Cherry Surprise, Reel Roulette, Turbo Time and Super Spinna. Options like Re-Light, Skillshot, Lose, Stoppa and Skill Continue are also present on the board. You don’t need to worry about the betting system of Wheel of Plenty. It starts at $0.10 and it can go up to $10, using a single coin at all times. The rewards will put up to 2,000 coins in your pocket, meaning a maximum of $20,000. 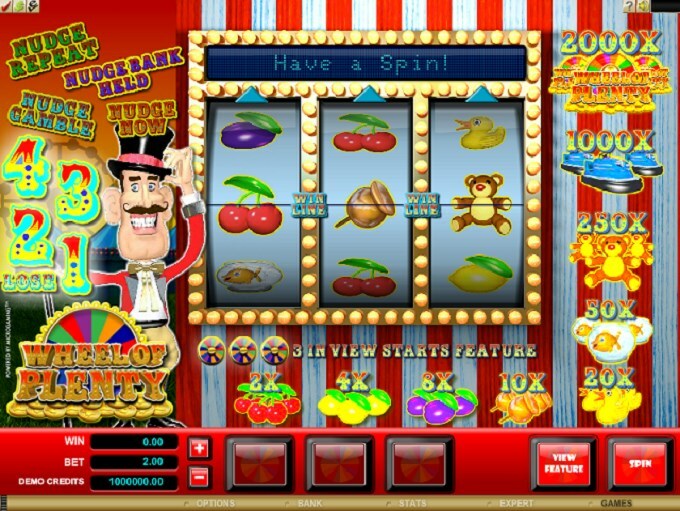 The design is colorful and it has a lot of details in it, with a design style that I’d call average normally, but for a classic slot machine it’s actually not that bad. The reels are surrounded by led lights, with symbols being things that the amusement parks might offer you. You have a character that looks like a Magician or a Ringmaster, placed on the left side of the reels. Symbols: Wheel of Plenty (scatter), Wheel of Plenty Logo (2,000 coins), Bumper Car (1,000 coins), Teddy Bear (250 coins), Gold Fish (50 coins), Rubber Duck (20 coins), Candy Apple (10 coins), Plum (8 coins), Lemon (4 coins) and Cherry (2 coins). The game has its advantages, like the wealth of features offered through the only bonus game that the base game has, or the design which is better than average. This developer offers a lot of titles just like this one, and they’re all pretty cool slots considering that they have 3 reels. You will find Wheel of Plenty at any online casino which chooses to use software from Microgaming, playable either for free or for real money.